King George VI recommended that the old custom of identifying villages with carved or painted name signs could be revived. In 1920, Biddenden had won a Daily Mail competition for a sign featuring the two Biddenden Maids. Littlebourne is a village and civil parish 4 miles from Canterbury and 6 miles from Sandwich in Kent. It is situated on the A257 Canterbury to Sandwich and Deal Road. The village’s 13th-century church, St Vincent of Saragossa, is thought to have been founded by the monks of St Augustine's Abbey in Canterbury and contains an ancient wall painting depicting Saint Christopher, patron saint of travellers. It is also thought that the convent of St Augustine used Littlebourne for the plantation of vines. The great barn that flanks one side of the churchyard is thought to have been their 14th century grange. The village stands beside the Little Stour River. There are still a number of quaint timbered houses but development in the 1960s, especially south of the church, expanded the original village. 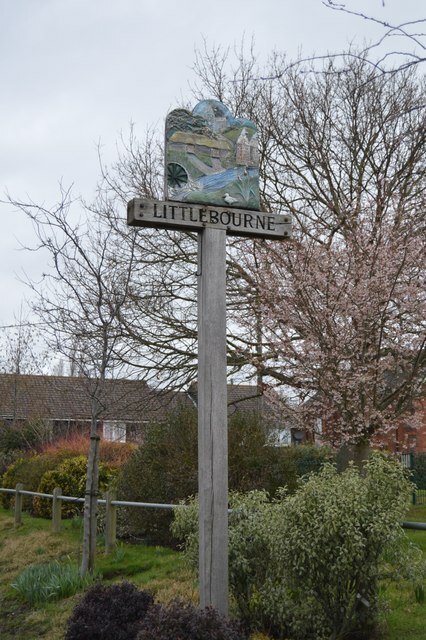 There are a few interesting buildings, including the very distinctive shape of the Littlebourne Mill at the northern end of the village, straddling the river, and a group of oast houses situated on a bend in the road. Howletts Wild Animal Park is a major attraction, located at nearby Bekesbourne. Littlebourne has 2 pubs, The Evenhill pub and hotel, and the Anchor Inn, as well as The Pilgrim’s Rest Tea Rooms that also has accommodation.